Metformin is a biguanide substance with antihyperglycemic properties that is used for treating non – insulin – dependent diabetes mellitus. This drug can improve glucose levels in blood by decreasing the production of glucose in liver, decreasing intestinal absorption of glucose and increasing insulin-mediated glucose uptake. The drug is available under generic names: Apo-metformin and Metformin Hydrochloride and most common Brand names are: Glucophage, Glumetza, Glucophage XR, Fortamet, Metformin Sandoz, Diabex, Diaformin, Siofor, Metfogamma and Riomet. This drug can be also used in combination with other drugs such as: Actoplus Met (containing Metformin and Pioglitazone), Appformin (containing Metformin and L-Tyrosine), Avandamet (containing Metformin and Rosiglitazone), Glucovance (containing Metformin and Glyburide), Glipizide and Metformin HCl, Kazano (containg Metformin and Alogliptin), Jentadueto (containing Metformin and Linagliptin), Komboglyze (containing Metformin and Saxagliptin), Prandimet (containing Metformin and Repaglinide), Xigduo (containing Metformin and Dapagliflozin) and Synjardy (containing Metformin and Empaglifozin). Metformin is a synthetic pharmaceutical drug. Metformin is used alone or in combination with other drugs, such as insulin, for the treatment of type 2 diabetes. It controls the amount of glucose (sugar) in the blood. Metformin decreases the amount of glucose absorption from food and the amount of glucose produced in liver. Metformin also increases body’s response to insulin, a natural substance that controls and lowers the levels of blood glucose. Metformin is not used for the treatment of type 1 diabetes, because it is condition in which pancreas does not produce insulin and therefore cannot control the amount of sugar in the blood. Patients with diabetes and high blood sugar can develop complications that can be serious or life-threatening such as: kidney problems, heart disease, stroke, nerve damage, and eye complications. Taking medicines, making the changes of lifestyle such as: diet, exercise, quitting smoking; and regularly checking the levels of sugar in blood may help to manage diabetes effectively and to improve health. Therapy with metformin may also decrease the risk of having a stroke, heart attack, or other diabetes-related complications. Metformin can induce weight loss and that’s why it is the drug of choice for obese patients with diabetes type two. Metformin administration is associated with modest weight loss. When it is used alone, this drug doesn’t cause hypoglycemia as side effect; but, it may potentiate the hypoglycemic effects of sulfonylureas drugs and insulin if they are used together. 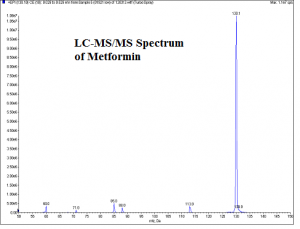 Metformin should not be used in patients with severely compromised renal function, where the value of creatinine clearance is lower than 30 ml/min, patients with acute decompensated heart failure, those who have severe liver disease and for 48 hours after administration of iodinated contrast dyes because the risk of lactic acidosis. This drug is also used in women with certain diseases of ovaries such as polycystic ovarian syndrome. Metformin administration may make regular menstrual cycles and increase fertility. 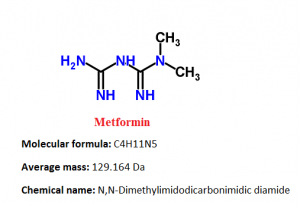 Metformin is the first line agent for the treatment of Type 2 Diabetes. Prediabetes: Metformin therapy for patients with high risk for type 2 diabetes may lower their chances of developing the disease, although intensive physical exercise and adequate diet work better for this purpose. Gestational diabetes: Metformin is effective and safe as insulin for the management of gestational diabetes. Women with gestational diabetes treated with metformin have less weight gain during pregnancy compared with those treated with insulin. Babies born to women treated with this drug have been found to develop less visceral fat, making them less predisposed to insulin resistance in later life. Polycystic ovary syndrome: Polycystic ovary syndrome (PCOS) is a condition which is commonly associated with insulin resistance. However, UK and international clinical practice guidelines do not recommend metformin for the first-line treatment or even do not recommend it at all, except for women with glucose intolerance. 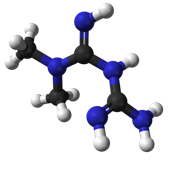 Metformin belongs to the class of organic compounds known as biguanides. These are organic compounds that have two N-linked guanidines. It is easily soluble in water and is practically insoluble in acetone, ether, and chloroform. The pKa of Metformin is 12.4. 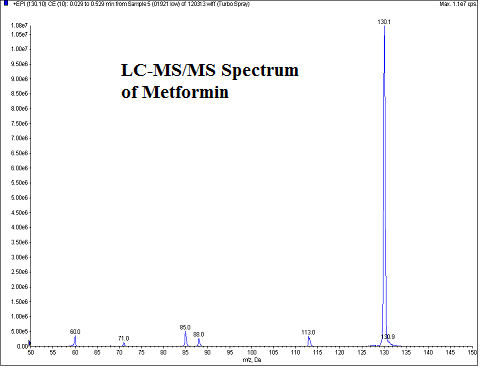 The pH of a 1% aqueous solution of Metformin hydrochloride is 6.68. The inactive ingredients in tablets with metformin are: pregelatinized starch, povidone (K-30), povidone (K-90), and magnesium stearate. Metformin is available in form of solution and tablets (film coated and extended release) in the following dosage forms: 500, 850 and 1000mg. Metformin reduces glucose levels in blood by decreasing the hepatic glucose production and intestinal glucose absorption, and by improving cell sensitivity to insulin by increasing peripheral uptake of glucose and utilization. These effects are mediated by the initial activation of AMP-activated protein kinase which is a liver enzyme that plays a significant role in insulin signalization, energy balance, and the metabolism of glucose and lipids. Activation of AMP- protein kinase is needed for inhibitory effect of metformin on liver cell production. Increased peripheral utilization of glucose is caused by improved insulin binding to its receptors. 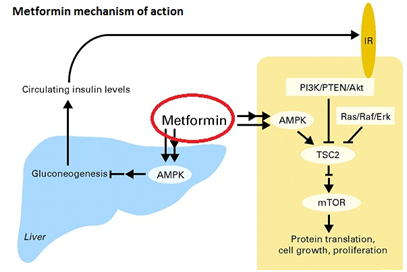 Metformin administration also increases AMP- protein kinase in skeletal muscle cells. AMP- protein kinase is known to cause deployment of GLUT-4 to the cell plasma membrane, which results in insulin-independent glucose uptake. The rare side effect called lactic acidosis can be caused by decreased liver uptake of lactate, which is one of the substrates of gluconeogenesis. Patients who have healthy renal function, the slight excess are simply cleared. However, patients who have severe renal impairment the accumulation of lactic acid can be clinically significant. Conditions such as severe hepatic disease and acute/decompensated heart failure may precipitate lactic acidosis. There is no fixed dosage of metformin for the treatment of hyperglycemia in patients who have diabetes type two. Dosage of metformin must be individualized on the basis of both effectiveness and tolerance, and the maximum recommended daily doses must not be exceeded. The maximum recommended daily dose of Metformin is 2550 mg for adults and 2000 mg for pediatric patients (10 to 16 years of age). Metformin should be given in divided doses during meals. Treatment with metformin should be started with a low dose, with gradual escalation of dose, by reducing gastrointestinal side effects and permitting identification of the lowest dose that is required for appropriate glycemic control of the patient. At the beginning of therapy and during dose titration, fasting plasma glucose should be used to determine therapeutic response to Metformin and for the identification of the minimum effective dose for each patient. Therefore, glycosylated hemoglobin – HbA1c should be measured at intervals of every month. The therapeutic target should be decreasing both fasting plasma glucose and HbA1c levels to normal by using the lowest effective dose of metformin either when used as monotherapy or together with sulfonylurea or insulin. Short-term administration of Metformin may be appropriate during periods of transient loss of control in patients usually well-controlled on diet alone. Adults – Clinically significant responses are not seen at doses below 1500 mg per day in general. However, a lower starting dose and gradually increased dosage is advised for minimization of gastrointestinal symptoms. The usual starting dose of Metformin is 500 mg twice per day or 850 mg once per day and these drugs should be given during meals. Dosage increases should be made in increments of 500 mg weekly or 850 mg every 2 weeks, up to a maximum dose of 2000 mg daily, and it should be given in divided doses. Patients can also be titrated from 500 mg twice a day to 850 mg twice a day after 2 weeks. For those patients requiring additional glycemic control, Metformin may be given to a maximum daily dose of 2550 mg per day. For doses above 2000 mg may have better toleration if they are given three times a day during meals. If higher doses of metformin are needed, Metformin should be used at maximum daily doses up to 2550 mg administered in divided doses. Pediatrics – The usual initial dose of Metformin is 500 mg twice per day, given during meals. 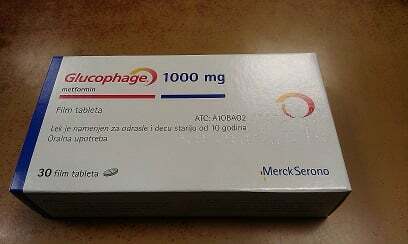 Dosage increases should be made in increments of 500 mg by week up to a maximum dose of 2000 mg per day, given in divided doses. Absorption and Bioavailability: Pharmacokinetic studies have shown that absolute bioavailability of a 500mg Metformin tablet given under fasting conditions is around 50% – 60%. Studies that have used single oral doses of Metformin 500 mg to 1500 mg, and 850 mg to 2550 mg, show that there is a lack of dose in proportion with increasing doses, which is because of decreased absorption rather than an alteration in elimination. Food can decrease the extent of and in small amount delays the metformin absorption. Distribution: Metformin only slightly bound to plasma proteins, in contrast to sulfonylureas drugs used for the treatment of diabetes type 2, which have more than 90% protein bound. 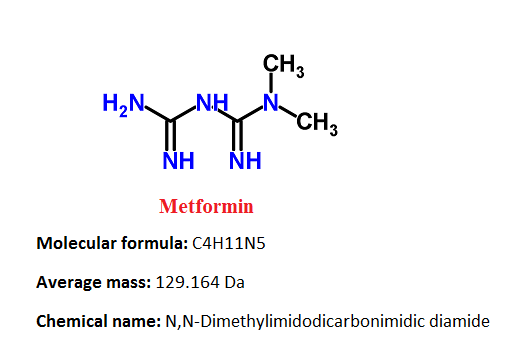 Metformin partitions into erythrocytes, is in a function of time. At usual therapy doses and dosing schedules of Metformin, steady-state plasma concentrations are reached within 24 to 48 hours. Controlled clinical trials of Metformin HCl, showed that maximum metformin plasma levels did not exceed 5 mcg/mL, even at highest doses. Metabolism and Elimination: Intravenous single-dose studies showed that metformin is excreted unchanged in the urine and does not have an impact on hepatic metabolism. Renal clearance is approximately 3.5 times greater compared to creatinine clearance, which indicates that the major route of metformin elimination is tubular secretion. Patients with Type 2 Diabetes: If renal function is normal, there are no differences between single or multiple-dose pharmacokinetics of metformin between patients with type 2 diabetes and healthy patients nor is there any accumulation of metformin in either group at usual clinical doses. Patients with Renal Insufficiency: In patients with decreased renal function, the plasma and half-life of metformin in blood can be prolonged and the renal clearance is decreased in proportionally to the decrease in clearance of creatinine. Patients with Hepatic Insufficiency: There are no relevant studies for the patients with hepatic insufficiency. Geriatrics: Studies showed that in healthy elderly patients total plasma clearance of metformin is decreased, and that the half-life is prolonged, so maximal concentrations of metformin in blood are increased, in comparison with healthy adults. From these data, it appears that the change in metformin pharmacokinetics with aging is primarily attributed to a change in renal function. Therapy with metformin should not be given in patients older than ≥80 years unless levels of creatinine clearance demonstrate that renal function is not reduced. What special precautions should I follow/ What should I avoid while using Metformin? Before taking this medicine, patients should tell their doctor or pharmacist if they are allergic to metformin; or if they have any other allergies. Products with metformin may contain inactive ingredients that can cause allergic reactions or other problems. Before using this medicine, patients should tell their doctor or pharmacist their medical history, especially if they ever had or have: breathing problems such as obstructive lung disease and asthma, blood problems such as anemia or vitamin B12 deficiency, kidney or liver disease. Patients should tell their doctors that they are using metformin before having surgery or any X-ray scanning procedure that use injectable iodinated contrast material. Patients may experience blurred vision, drowsiness or dizziness, or due to extremely low or high blood sugar levels. They should not drive, use machinery, or do any activity that requires alertness or clear vision until they are sure that they can perform such activities safely. Patients should limit the usage of alcohol while using this medication because alcohol can increase the risk of lactic acidosis and low blood sugar can be developed. High fever, diuretic such as hydrochlorothiazide, too much sweating, prolonged diarrhea, and vomiting may cause dehydration and increase the risk of lactic acidosis. Patients should stop taking metformin and tell their doctor if they have prolonged diarrhea or vomiting. Geriatric patients may be at higher risk for side effects such as low blood sugar or lactic acidosis. Pregnant patients should use this medication only when it is clearly needed. Patients should discuss the risks and benefits with their doctor. Doctor may direct to use insulin instead of metformin during pregnancy. Metformin can make changes in the menstrual cycle, such as promote ovulation and this drug may also increase the risk of becoming pregnant. Metformin can pass into breast milk, but only in small amounts. Patients should consult their doctor before breast-feeding. Which pregnancy category (A; B; C; D; X) has been assigned to Metformin? Metformin has been given pregnancy category B by the FDA. Recent findings strongly suggest that abnormal concentrations of glucose in blood during pregnancy are associated with a higher incidence of congenital abnormalities. Most health professionals recommend that insulin should be used during pregnancy to maintain blood glucose levels in blood as close to normal as possible. Because animal reproduction studies are not always predictive of human response, Metformin should not be used during pregnancy only if it is clearly needed. There are no relevant and well-controlled studies in pregnant women with Metformin administration. Studies showed that Metformin were not teratogenic in rabbits and rats at doses up to 600 mg/kg per day which is about two and six times the maximum recommended human daily dose of 2000 mg based on body surface area comparisons for rats and rabbits. Studies conducted on lactating rats show that metformin can be excreted into milk and reach levels which are comparable to those in blood. However, similar studies have not been conducted in nursing mothers. Because of metformin can cause hypoglycemia in nursing, a decision should be made whether to withdraw nursing or to discontinue the drug, taking into account the importance of the drug to the mothers health. If Metformin is withdrawn, and if diet alone is unsuccessful for controlling the levels of blood glucose, insulin therapy should be considered. This medication should be kept in the container it came in, out of reach of children and tightly closed. It should be stored at room temperature and away from extra heat and moisture (not in the bathroom). Outdated medications should be thrown away. Patients should talk with their pharmacist about the proper disposal of this medication. Patients should follow all exercise and dietary recommendations made by their doctor or dietitian. It is important to eat a healthful diet. The table below shows the incidence of side effects after Metformin administration in recommendable doses. The incidence can be increased if this drug is overdosed. Next table shows the incidence of side effects from the clinical study conducted in US. 141 patients received Metformin therapy (up to 2550 mg per day) and 145 patients received placebo. Gastrointestinal side effects are very common after metformin usage; it is most common after metformin initial administration, or when the dose is increased. The gastrointestinal discomfort can be avoided by beginning at a low dose and increasing the dose gradually. Long-term administration of metformin can cause increase levels of homocysteine levels and malabsorption of vitamin B12. Higher doses and prolonged usage are associated with increased incidence of vitamin B12 deficiency, and some researchers recommend screening or prevention strategies. The most serious potential side effect of Metformin and other biguanidines administration is lactic acidosis, a physiological condition that is characterized with low pH value in body tissues and blood (acidosis) accompanied by the accumulation of lactate, especially L-lactate, and is considered a different form of metabolic acidosis. Metformin-associated lactic acidosis has the incidence of 9/100 000 persons a year. Lactate uptake by the liver is reduced after metformin administration because lactate is important substrate for hepatic gluconeogenesis – process which metformin inhibits. In healthy individuals, this lactate is simply cleared by other mechanisms through the kidneys, and there is no significant elevation of lactate in blood. However, when impaired renal function exists, clearance of metformin and lactate is reduced, and this can lead to increased levels of both, and possibly causing an accumulation of lactic acid. Because Metformin decreases liver uptake of lactate, any condition such as alcoholism, heart failure or respiratory disease (due to inadequate oxygenation of tissues) may precipitate lactic acidosis is a contraindication to its use. Typical signs and symptoms of lactic acidosis are: nausea, vomiting, muscle weakness and rapid breathing. Does Metformin have any interaction with other drugs? Glyburide: Studies showed decreases in glyburide maximal concentrations in blood after concomitant use with metformin. Furosemide: Furosemide can increase metformin plasma concentration without any significant change in metformin renal clearance. Nifedipine: Nifedipine can increase plasma concetration of metformin and also the amount excreted in the urine. Nifedipine appears to increase the absorption of metformin. Metformin have minimal effects on nifedipine. Cationic drugs: Cationic drugs such as: morphine, procainamide, quinidine, amiloride, digoxin, , quinine, ranitidine, triamterene, trimethoprim, or vancomycin that are eliminated by renal tubular secretion theoretically may have the potential for interaction with metformin by competing for common renal tubular transport systems. Other drugs: Some drugs such as corticosteroids, phenothiazines, thiazides and other diuretics, phenytoin, nicotinic acid, sympathomimetics, calcium channel blocking drugs, thyroid products, estrogens, oral contraceptives and isoniazid can produce hyperglycemia and may lead to loss of glycemic control. Intravascular iodinated contrast materials: Intravascular contrast iodinated materials can lead to acute alteration of renal function and have been associated with lactic acidosis in patients who were receiving metformin. Thus, patients should temporarily discontinue Metformin at the time of or prior to the procedure. Renal dysfunction: In patients, with renal dysfunction, renal function should be assessed more frequently and Metformin should be discontinued if evidence of renal impairment is present. Hypoglycemia: Hypoglycemia does not occur in patients who are receiving Metformin alone under usual circumstances of administration, but could occur when caloric intake is deficient, when exercises are not compensated by caloric supplementation or during concomitant use with other glucose-lowering agents or ethanol. Hypoxic states: Cardiovascular collapse from whatever cause, acute congestive heart failure, acute myocardial infarction and other conditions characterized by hypoxemia have been associated with lactic acidosis and may also cause prerenal azotemia. When such events occur in patients on Metformin therapy, the drug should be promptly discontinued. Surgical procedures: Metformin HCl therapy should be temporarily suspended before any surgical procedure (except minor procedures) and should not be restarted until the patient’s oral intake has resumed and renal function has been evaluated as normal. Alcoholism: Alcohol can potentiate the effects of metformin on lactate metabolism. Patients, should be warned against excessive alcohol intake, acute or chronic, while receiving Metformin therapy. Vitamin B 12 levels: Clinical studies showed that Metformin can decrease levels of vitamin B12 without clinical manifestations. However, such decrease, possibly due to interference with B12 absorption from the B12-intrinsic factor complex, is very rarely associated with anemia and appears to be reversible with withdrawal of Metformin or with Vitamin B12 supplementation.